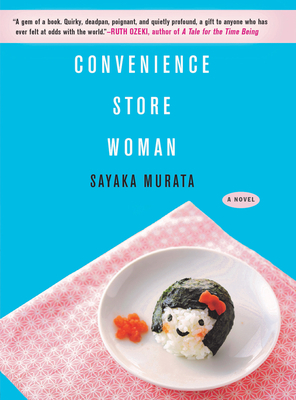 The surprise hit of the summer and winner of Japan's prestigious Akutagawa Prize, Convenience Store Woman is the incomparable story of Keiko Furukura, a thirty-six-year-old Tokyo resident who has been working at the Hiiromachi "Smile Mart" for the past eighteen years. Keiko has never fit in, neither in her family, nor in school, but in her convenience store, she is able to find peace and purpose with rules clearly delineated clearly by the store's manual, and copying her colleagues' dress, mannerisms, and speech. She plays the part of a "normal person" excellently--more or less. Keiko is very happy, but those close to her pressure her to find a husband and a proper career, prompting her to take desperate action. A sharp-eyed look at contemporary work culture and the pressures we all feel to conform, Convenience Store Woman offers a brilliant depiction of a world hidden from view and a charming and fresh portrait of an unforgettable heroine. Sayaka Murata is one of Japan's most exciting contemporary writers. She still works part time in a convenience store, which was the inspiration to write Convenience Store Woman, her English-language debut and winner of one of Japan's most prestigious literary prizes, the Akutagawa Prize. She was named a Freeman's "Future of New Writing" author, and her work has appeared in Granta and elsewhere. In 2016, Vogue Japan selected her as a Woman of the Year. Ginny Tapley Takemori has translated works by more than a dozen Japanese writers, including Ryū Murakami. She lives at the foot of a mountain in Eastern Japan.